For people to be hungry in Africa in the 21st century is neither inevitable nor morally acceptable. The world's emergency response requires an overhaul so that it delivers prompt, equitable, and effective assistance to people suffering from lack of food. More fundamentally, governments need to tackle the root causes of hunger, which include poverty, agricultural mismanagement, conflict, unfair trade rules, and the unprecedented problems of HIV/AIDS and climate change. The promised joint effort of African governments and donors to eradicate poverty must deliver pro-poor rural policies that prioritise the needs of marginalised rural groups such as small-holders, pastoralists, and women. 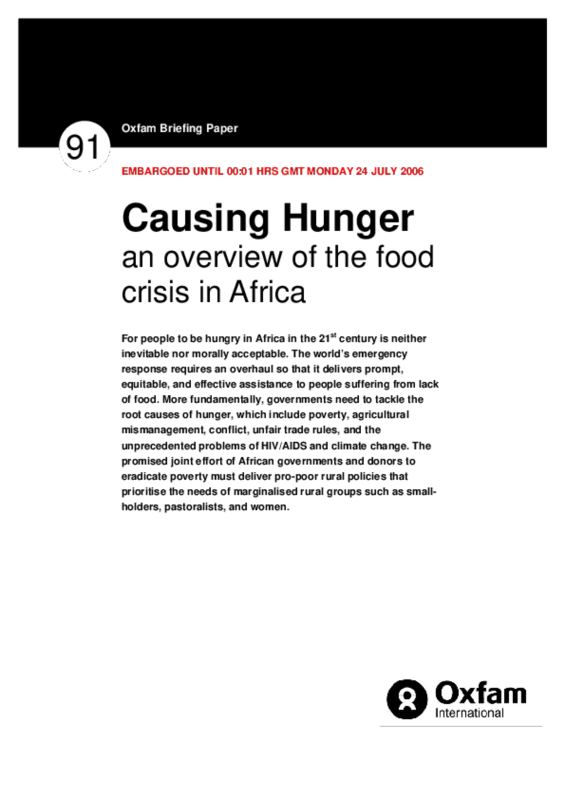 This paper describes two key challenges in reducing hunger in Africa. The first is to improve the immediate response to food crises. The second is to tackle the root causes of acute and recurring hunger. The paper is not a complete explanation of causes and solutions. Rather, it hopes to offer some insights based on Oxfam's programme experience and research with pastoralists, farmers, and others across Africa.